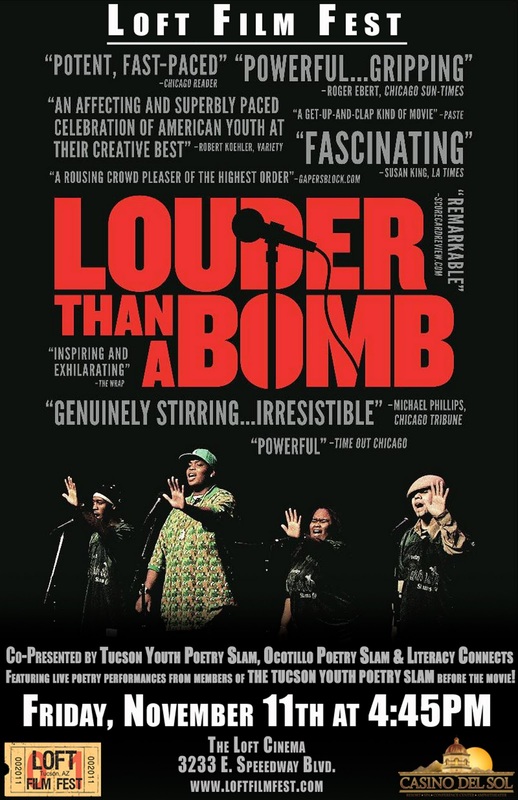 Friday, November 11th at 4:45 p.m.
Don’t miss the Tucson Premiere of the award-winning documentary LOUDER THAN A BOMB, featuring live poetry performances from the TUCSON YOUTH POETRY SLAM before the movie! Every year, more than six hundred teenagers from over sixty Chicago area schools gather for the world’s largest youth poetry slam, a competition known as “Louder Than a Bomb”. Founded in 2001, Louder Than a Bomb is the only event of its kind in the country—a youth poetry slam built from the beginning around teams. 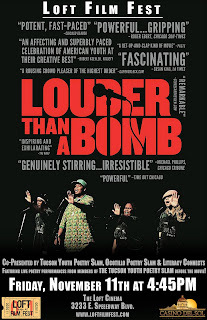 LOUDER THAN A BOMB chronicles the stereotype-confounding stories of four teams as they prepare for and compete in the 2008 event. By turns hopeful and heartbreaking, the film captures the tempestuous lives of these unforgettable kids, exploring the ways writing shapes their world, and vice versa. This is not traditional “high school poetry” as many often think of it. This is language as a joyful release, brought to life by irrepressibly talented teenagers obsessed with making words dance. How and why they do it—and the community they create along the way—is the story at the heart of this inspiring, award-winning documentary. This screening is co-presented by TUCSON YOUTH POETRY SLAM, OCOTILLO POETRY SLAM and LITERACY CONNECTS. TYPS Monthly – November – Feat. Mickey Randleman!